Free and open to the public (museum admission by voluntary contribution after 3 p.m.). Wednesday, March 7, 2018, 7:00 pm – 8:00 pm. Join John Mck. Camp II, director of the Agora Excavations, Athens; and Niarchos Foundation Professor of Classics, Randolph-Macon College for this year’s Estelle Shohet Brettman Memorial lecture. 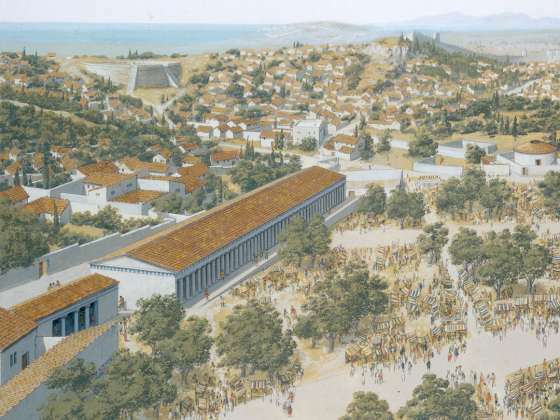 Entitled Daily Life in Ancient Athens: A View from the Agora, his talk explores recent excavations, inscriptions, and ancient sources that illustrate the varied daily activities in the Athenian agora, the center of the city. 617-369-3259 or here for tickets. In November 1999, the International Catacomb Society announced their sponsorship of the Estelle Shohet Brettman Memorial Lecture Series at the Museum of Fine Arts, Boston, in the Department of Art of the Ancient World. In 2005 the lecture series was permanently endowed. The series presents lectures and other programs dealing with the cultural, artistic, and religious history, and related archaeology of the ancient Mediterranean world, primarily the Roman Empire and its provinces during the period of the 5th century B.C.E. through the 7th century C.E. All Brettman Memorial Lectures are free and open to the public.